Time for my annual Memorial Day garden photo shoot. What a gorgeous day, my goodness. 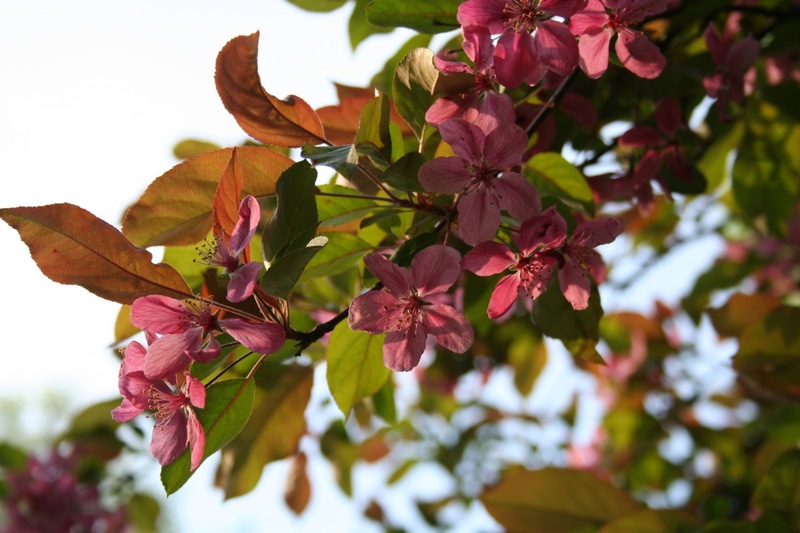 This is the last bloom for our fire blight-afflicted apple tree; we’re cutting it down in a few weeks. It sure does look gorgeous against our neighbor’s purple leaf maple though! 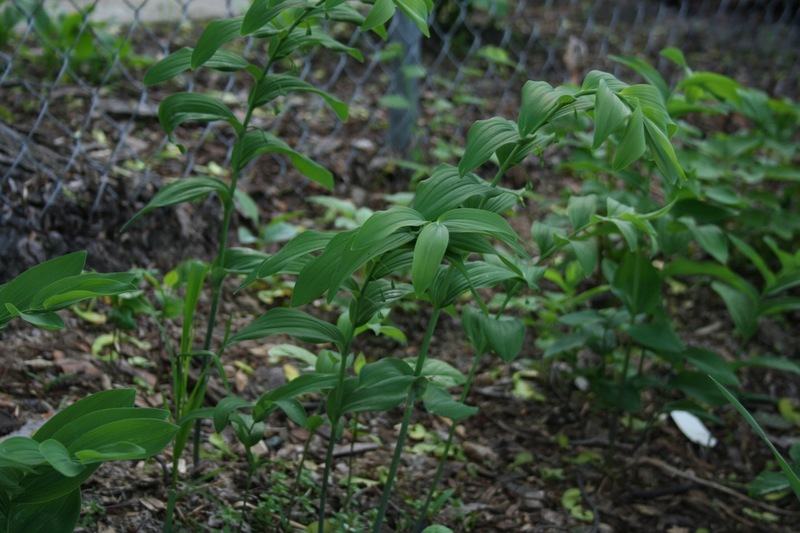 My Solomon’s Seal is finally really starting to look like something! 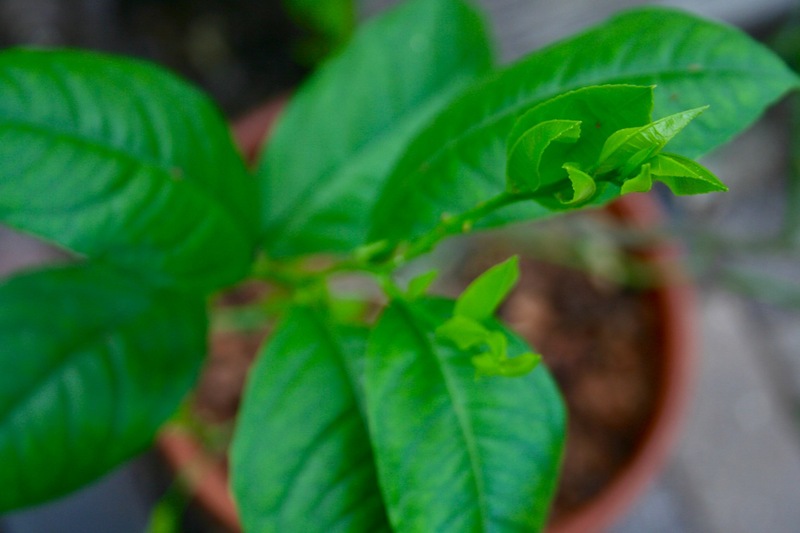 I think it will even bloom this year—note the tiny buds hanging delicately, like green pearls, from the stems. 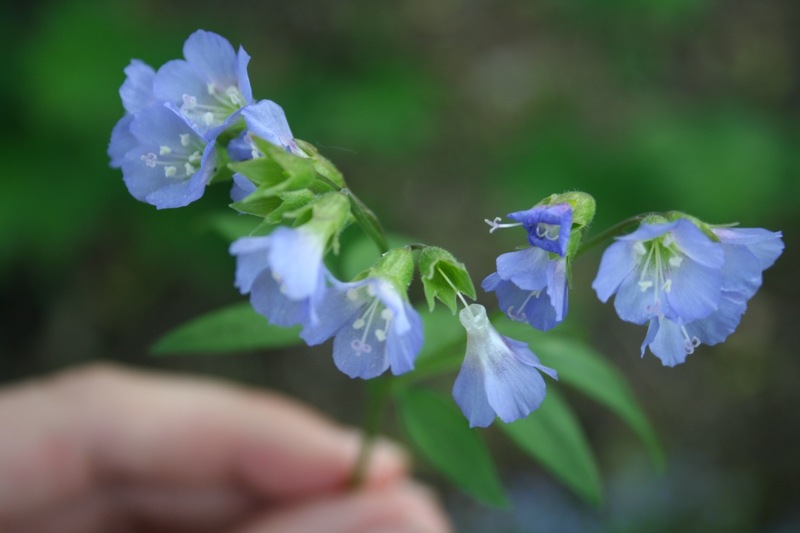 I can’t get over the delicate blue flowers of Jacob’s Ladder. 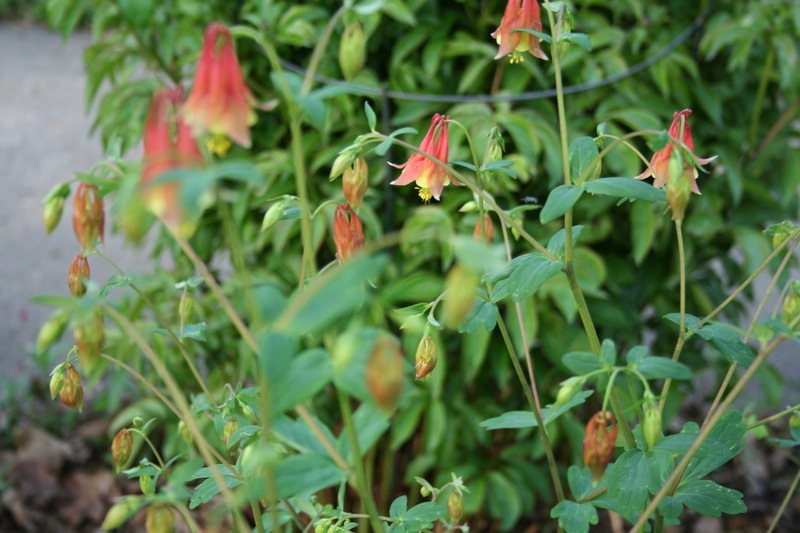 Next spring, I will need to give away some wild columbine. It’s taking over our entire yard! 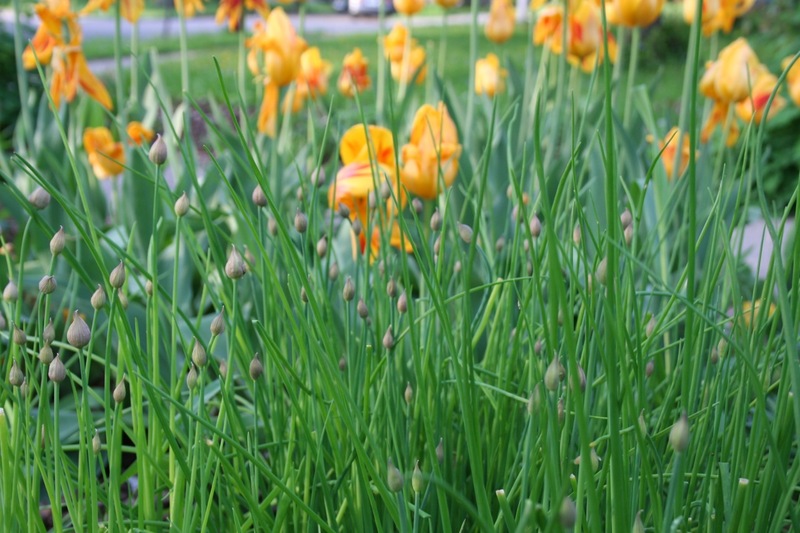 Chives are almost blooming, tulips are just about finished. I don’t remember a year when tulips bloomed this late. 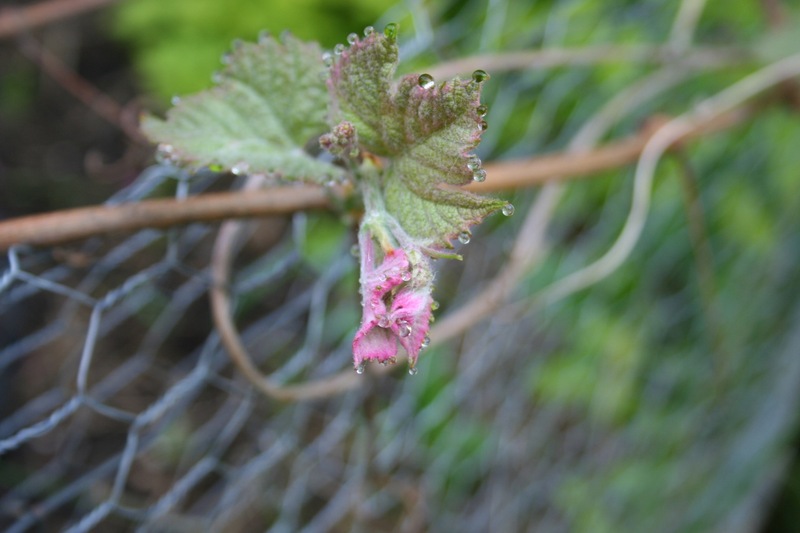 It was a challenging spring. 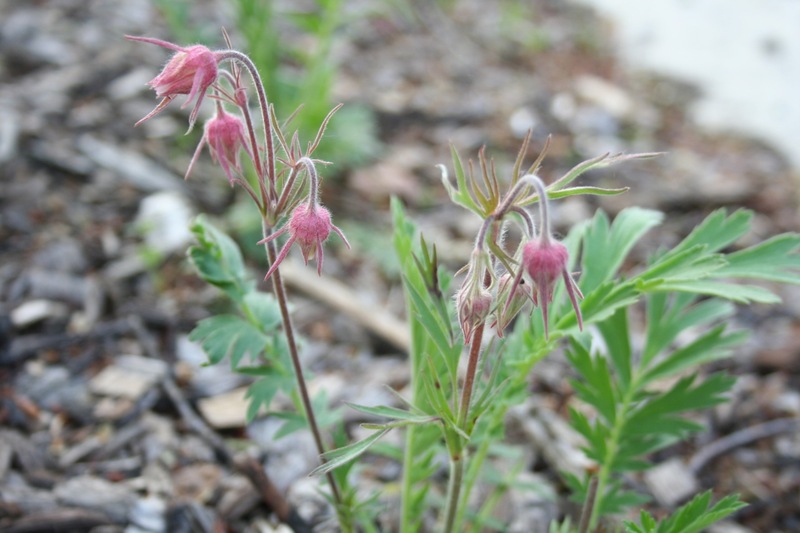 Prairie smoke blooming in my boulevard. This plant is really tiny! The rabbits left us a 3 foot section of grape vine this year! This year I’m trying a tomatillo for the first time. It’s got a blossom on it already! 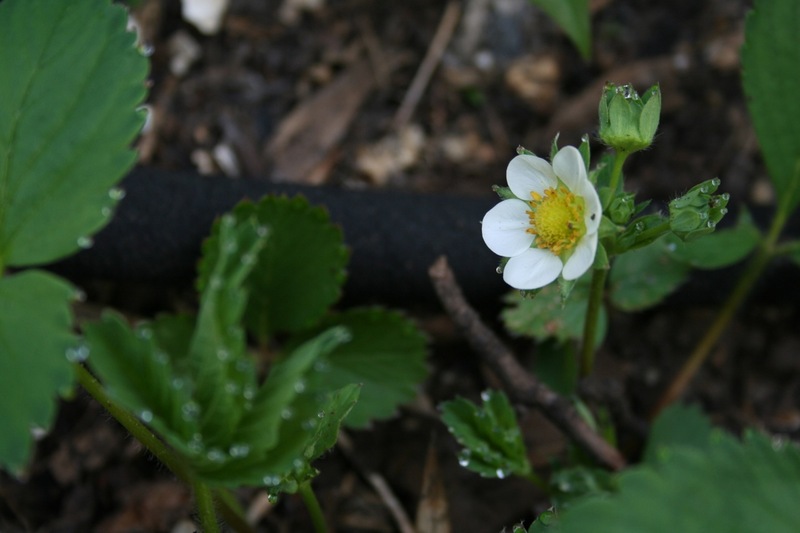 Strawberries are in full bloom, but unfortunately rabbits have eaten a lot of the plants. 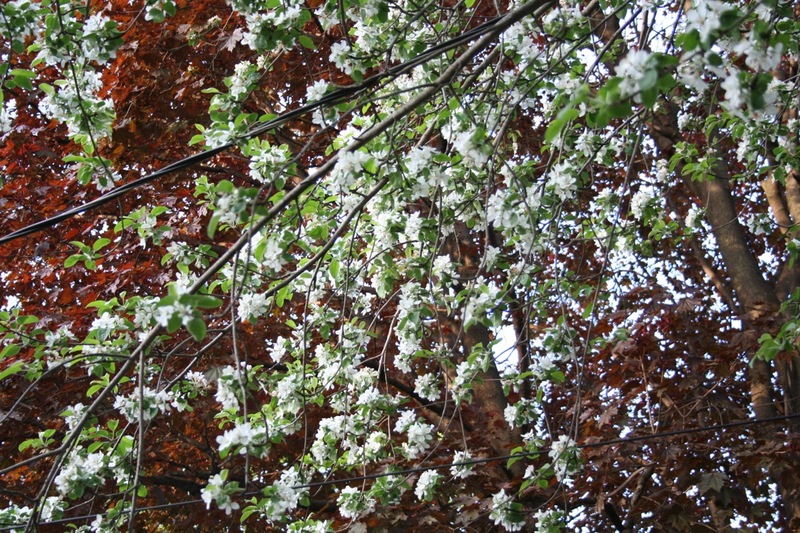 My neighbor’s crab apple tree in full bloom. Have a wonderful end to your 3-day weekend! 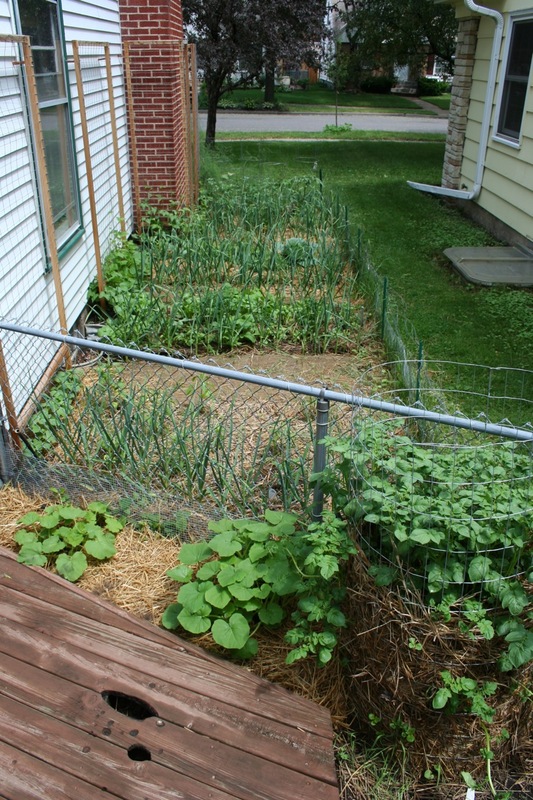 Categories: Gardening, Practical | Tags: edible landscaping, native plants, strawberries | Permalink. It’s the middle of June already! 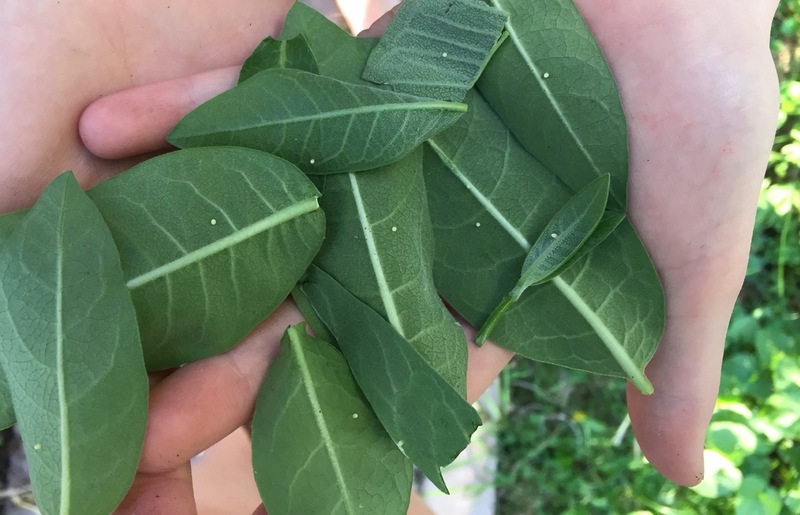 Time to check in on the edibles around the yard. 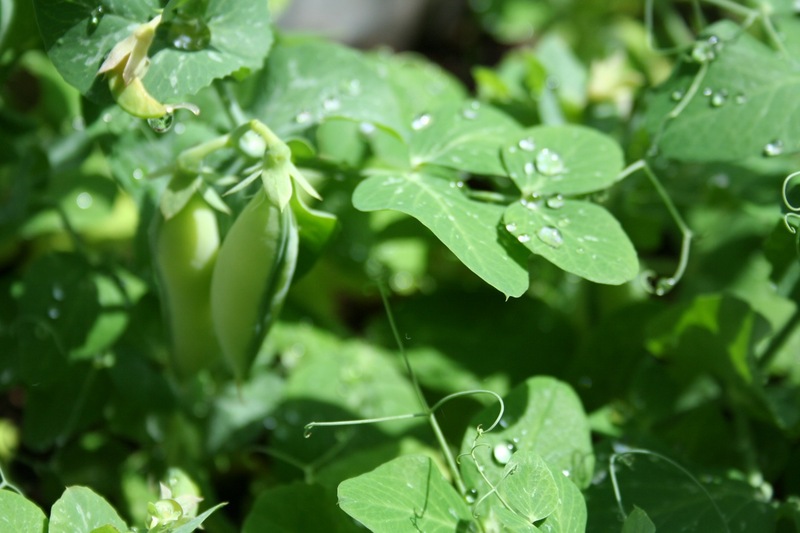 The Tom Thumb peas that the kids planted back in April (see picture at the top of the page) are finally just about ready. They are in a part-shade spot, and I don’t think they get *quite* enough sunshine to have reached their full potential. But we’ll get one solid meal, anyway. 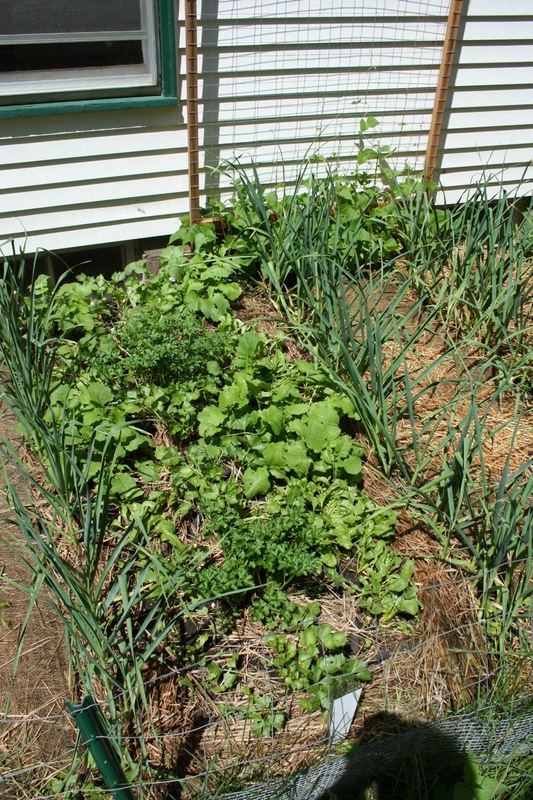 Rowan’s garden, with a couple of radishes left and some rather pathetic-looking “Gourmet Lettuce Mix” from High Mowing Organic Seeds. We had a couple of hot days. Also, I should have thinned a bit more. 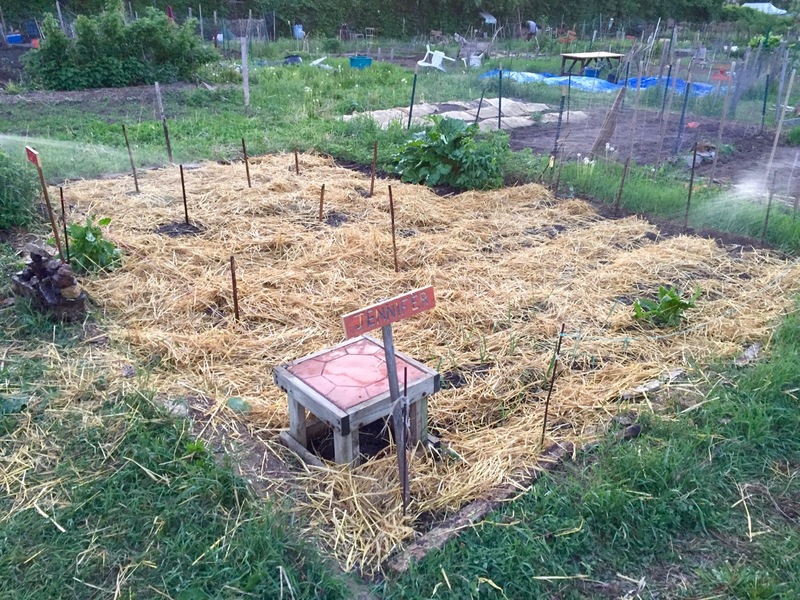 I am going to give this another 7-10 days and if things don’t look better, I’m ripping it all out and planting some quick-growers that we could harvest before fall: turnips, radishes, and maybe some kale. Anneke’s garden, on the other hand, is looking spectacular. 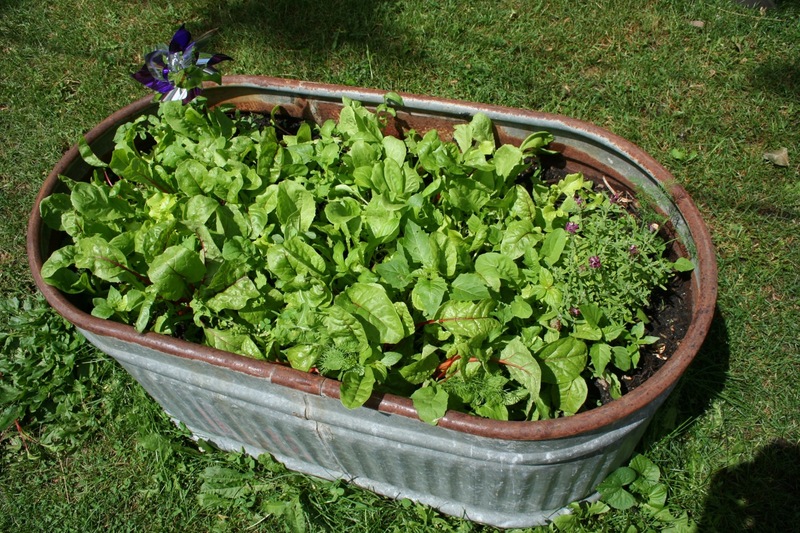 We planted it with a 50/50 mixture of Burpee Organic Mesclun mix and rainbow chard. 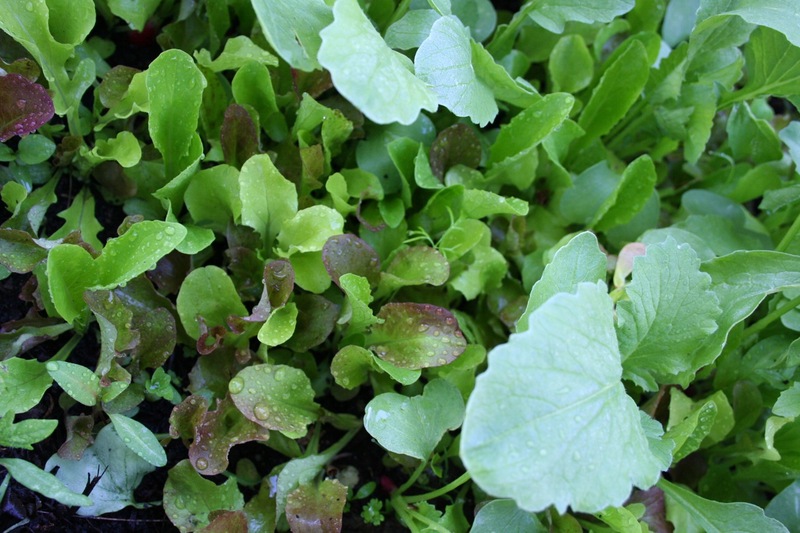 I’ve thinned it quite a few times, adding the baby greens to our salad bowl as we go. 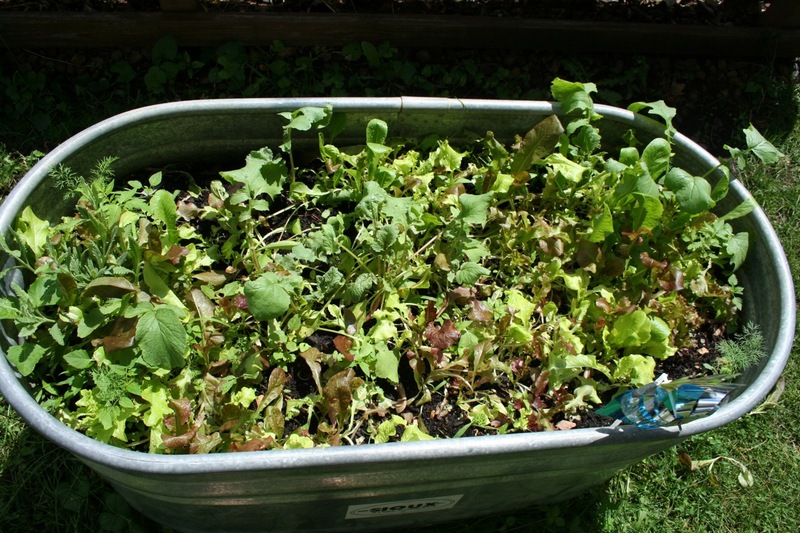 I don’t know if this mix is more heat tolerant than the other, but I think it has a greater variety of lettuce types. The arugula we thinned out and ate early on; it’s gone now. All that remains are the hardier greens and lots of chard, filling in nicely. 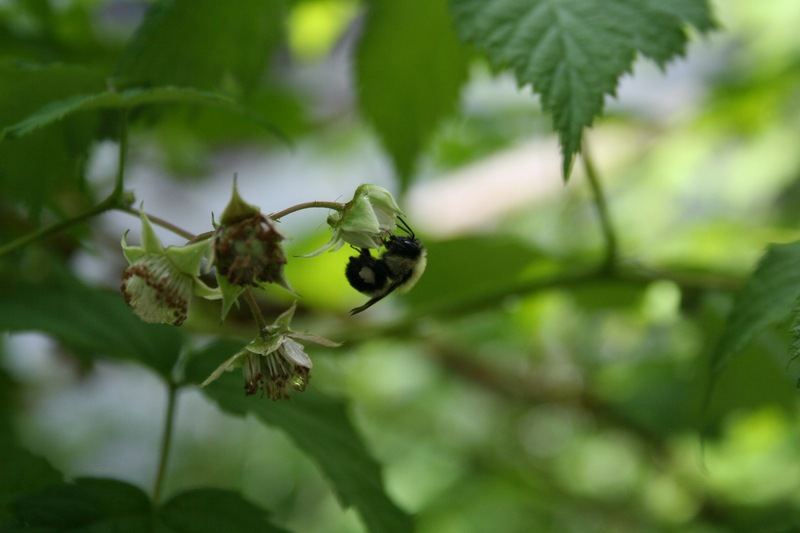 Bees are hard at work to give us raspberries in a few weeks. 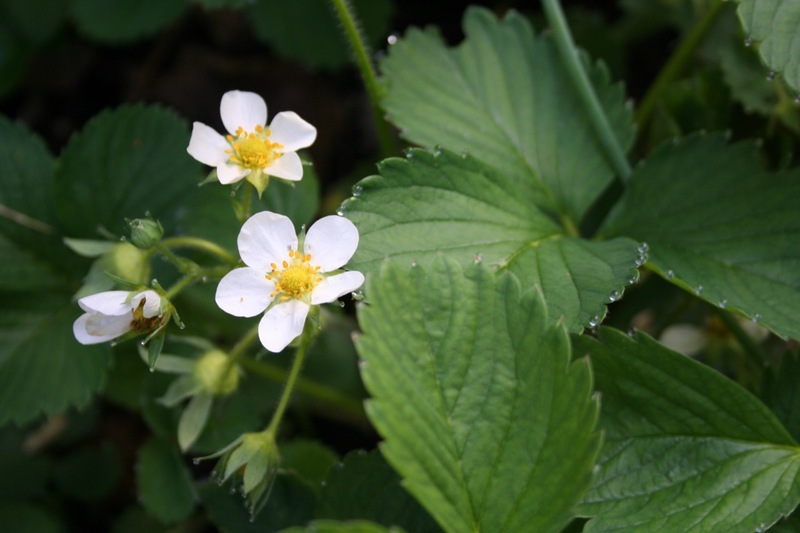 Alpine strawberries are loaded with fruit. Picking and eating immediately, every single day for about a week now. Regular strawberries are just getting going — picked the first actual bowl full tonight. Anneke was kind enough to stop eating strawberries long enough for me to shoot a quick comparison shot — alpine strawberries are tiny! The strawberry on the right is a standard size, like what you’d get at a pick-you-own farm (note: still smaller than grocery store strawberries). 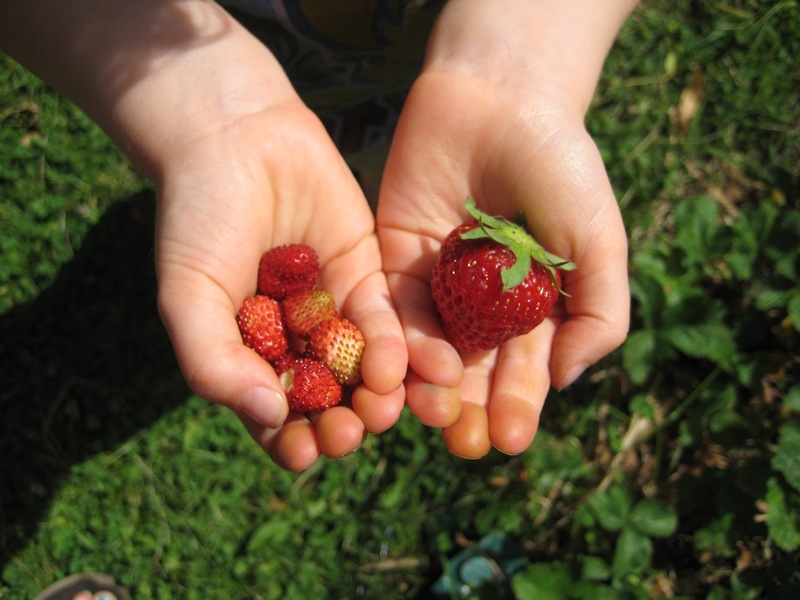 If making jam is your thing, you’d better plant 500 alpine strawberry plants and plan to spend your entire day picking. Rather, alpines are great for eating fresh, especially when you have a part-shade situation. 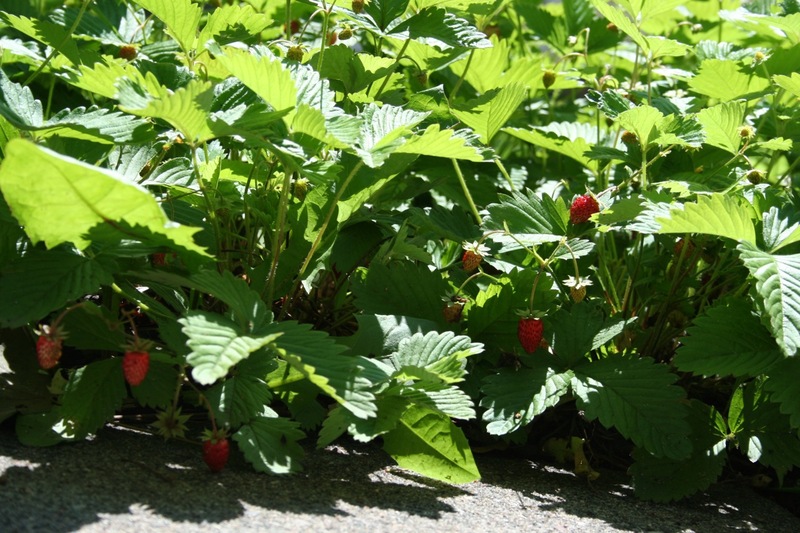 Regular strawberries will not produce much at all in part-shade, but alpines will. 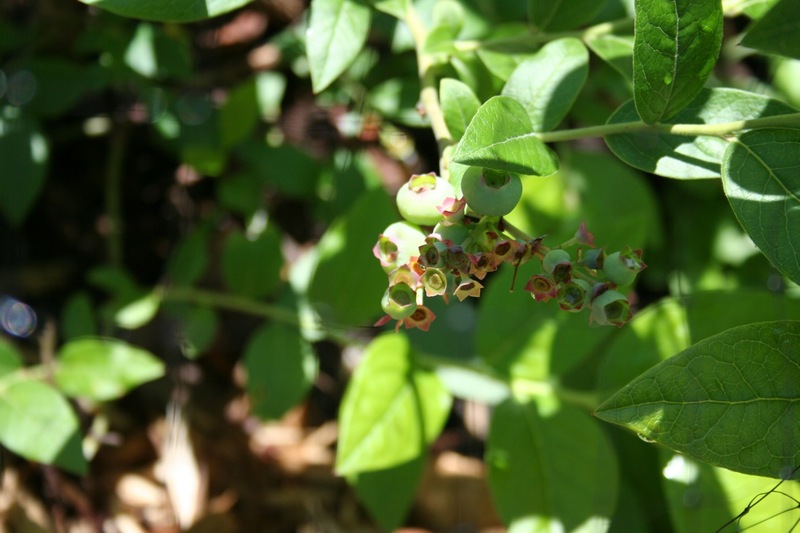 Blueberries! 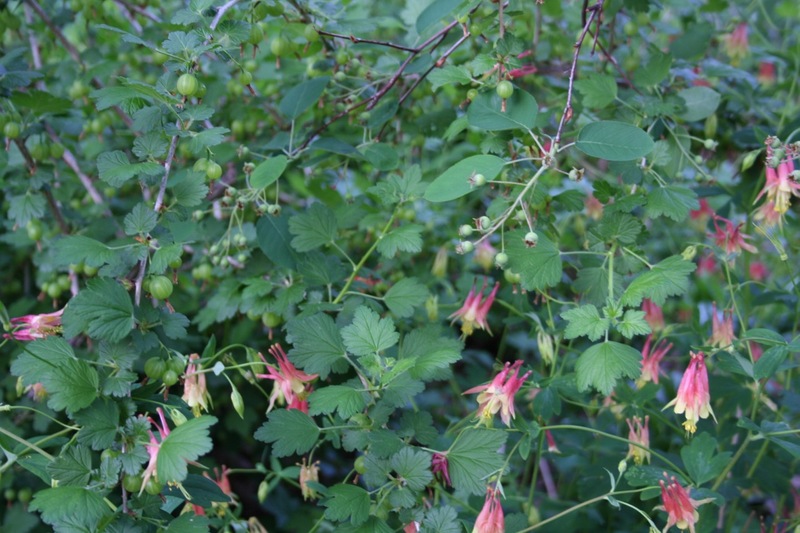 I pinched off most of the flowers on this plant, because it’s still so young, but I had to keep at least a small handful of berries for my efforts. Tomatoes. Absolutely mental. 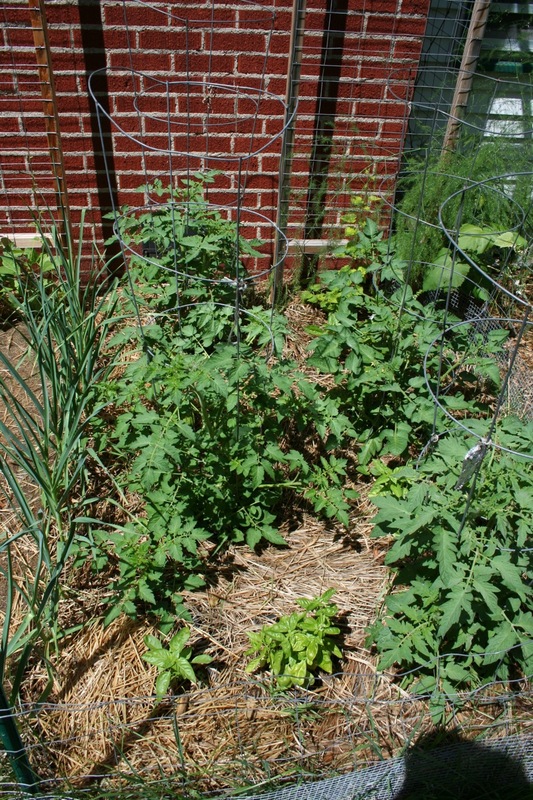 Could this be the year when I finally have a good tomato crop? Could it? Pretty please? Cabbage area. Lots of things going on here: two cabbages, chamomile, rosemary, kale, carrots, garlic on either side, a sage in the back, and chrismas lima beans climbing the trellis to the right. Didn’t have great carrot sprouting rates, hence the couple of semi-bare areas. Look at how free of insect damage my cabbages are. Unbelievable, considering the cabbage worms I dealt with last summer. 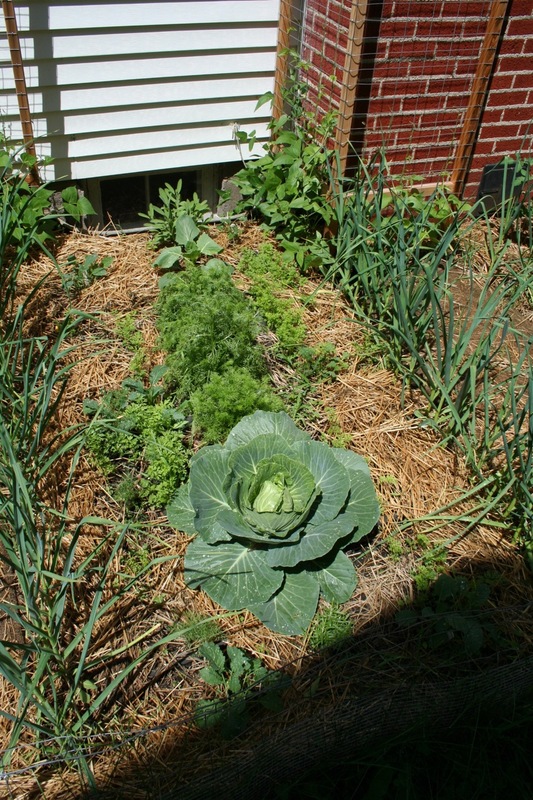 Could it be that surrounding my cabbages with herbs and garlic confounded them? Hard to say for sure. This area looks like total chaos but it’s actually quite nicely ordered according to my plan. It includes: golden beets, red beets, turnips, celeriac, parsley, rosemary, and some nice green pole beans climbing the trellis in the back to the right. 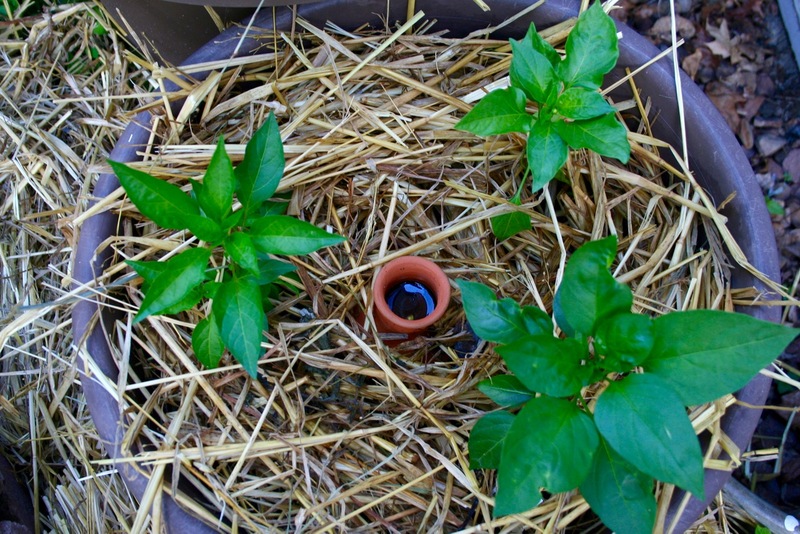 Finally, the peppers and eggplant, with cuke plants finally reaching up toward their trellis at the back. Everything is kinda slow-moving in this area so far, so I hope growth rates pick up. OK, that’s it! Lots going on here! 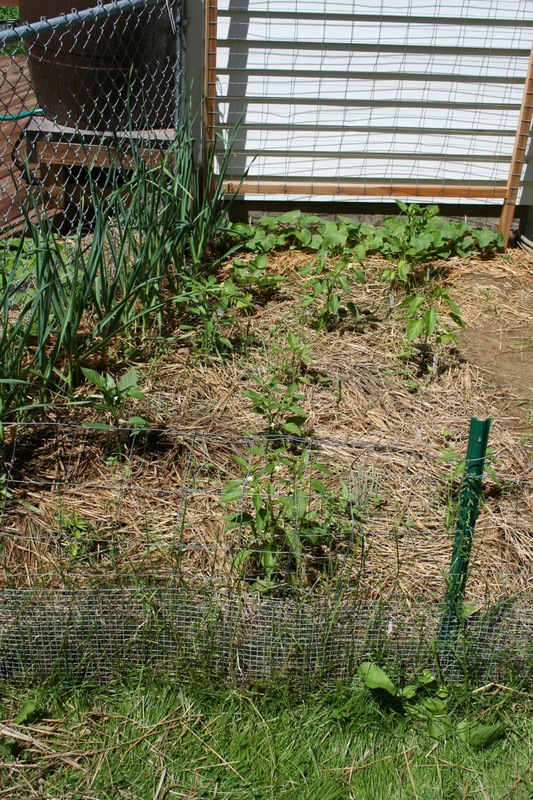 Categories: Gardening, Permaculture, Practical | Tags: beans, companion planting, garlic, Permaculture, raspberries, strawberries, tomatoes | Permalink. 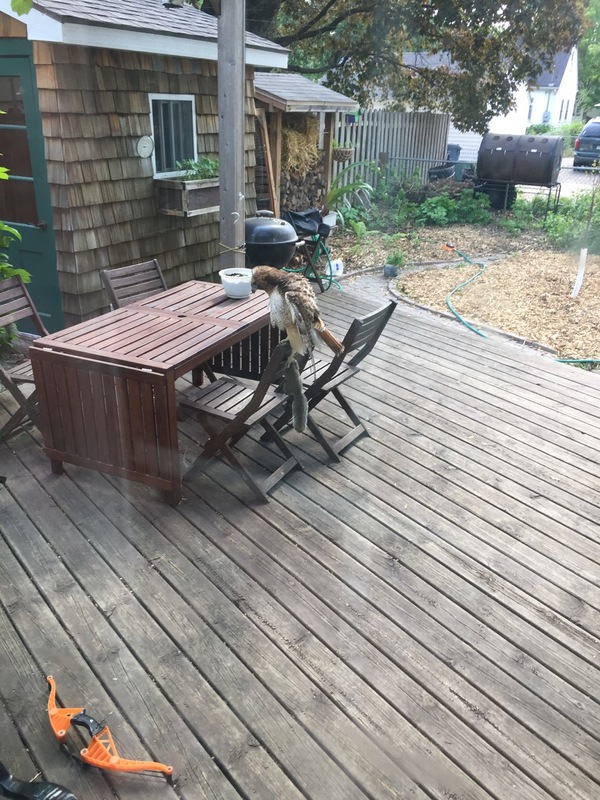 What can we eat NOW? Last weekend I did my annual Memorial Day phenology photo shoot in the garden. Phenology is the science of tracking when, for example, the daffodils first bloom in a certain location. It’s becoming a very important science for documenting climate change. 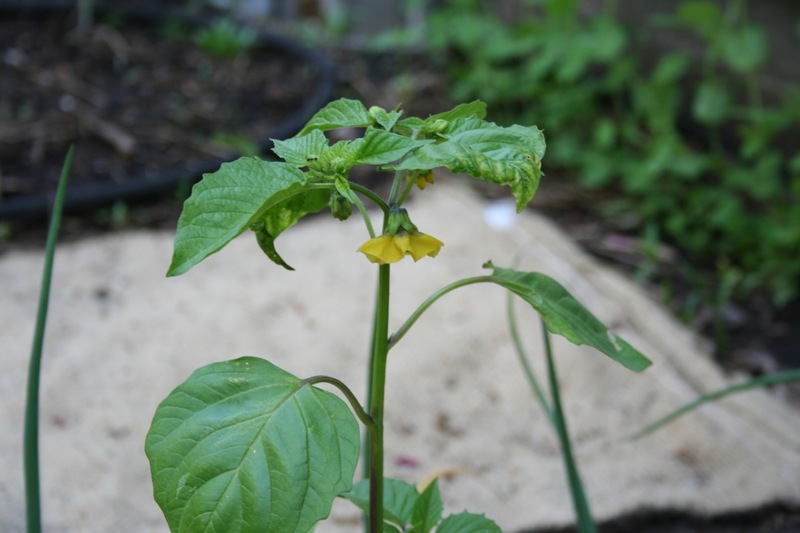 Beginning gardeners are often disappointed by how long it takes to finally have something to eat — tomatoes and peppers don’t produce much until late July, if you’re lucky. So what are some things we can grow that will give us early eats? 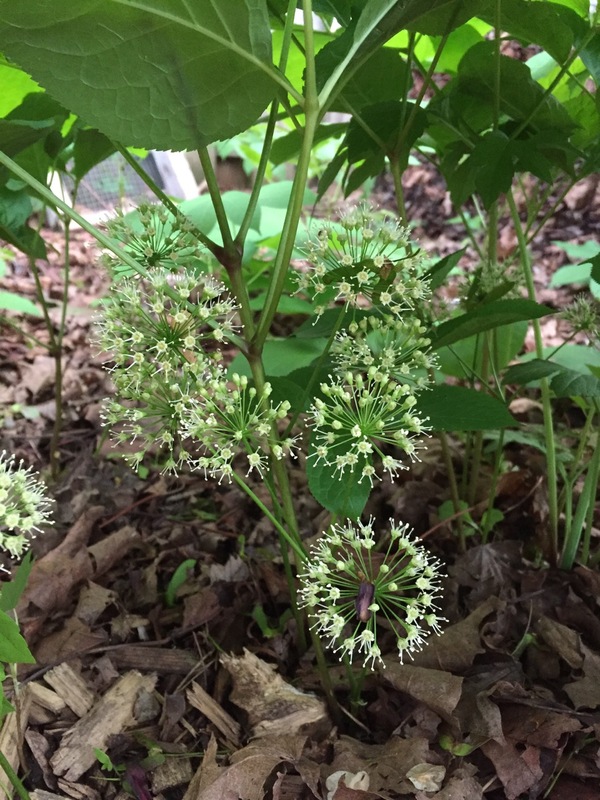 Look to edible perennials in the landscape, my friends. Let’s take a tour of some of the goodness we’re already enjoying in late May in Minnesota. 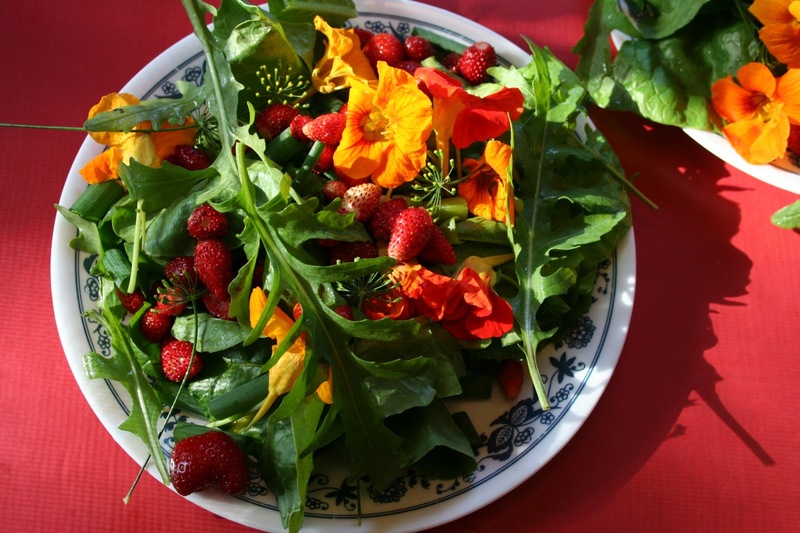 Asparagus and strawberries. The asparagus seeded out a couple weeks ago — the plants are finally mature enough that next year we should be able to harvest some. Boy, it’s been a long wait. 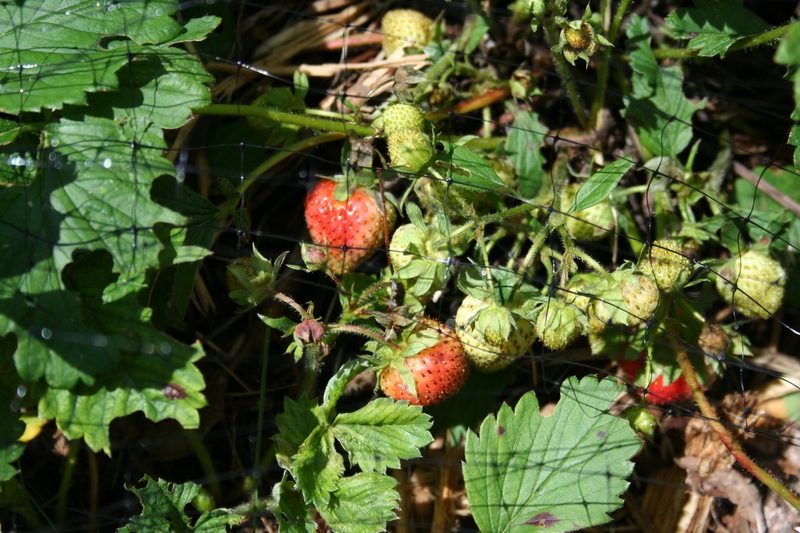 Strawberries should be ripe in 7-10 days, and new anti-rabbit netting seems to be helping. Dill. 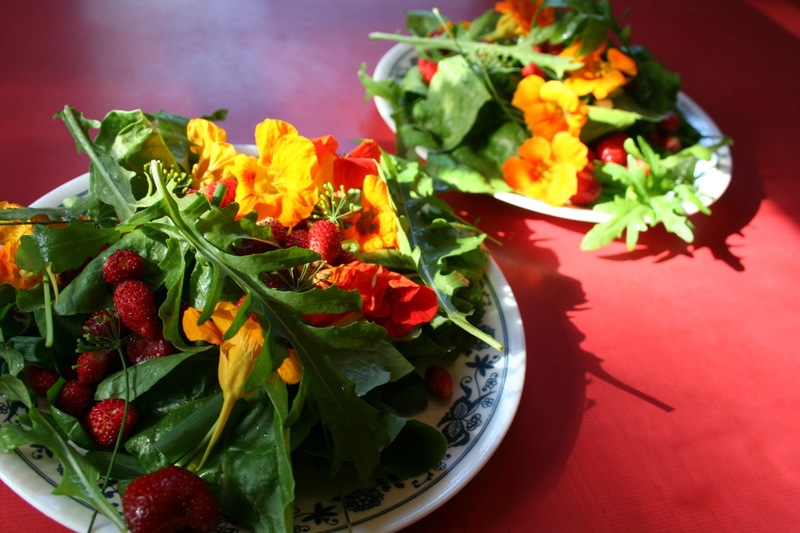 It’s needed thinning several times anyway, so I’ve been adding the tiny plants to salads and dressings. 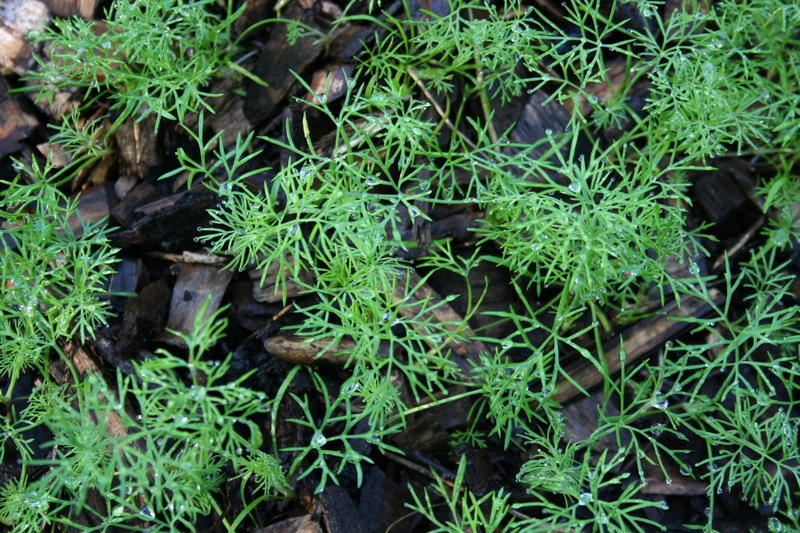 Dill is not technically a perennial, but it re-seeds itself. In great numbers. Plant it once and you’ll always have it. Everywhere. Lettuce and radishes! YES! We need to eat these up as fast as we can because the forecast for this week is hot. Left to right: oregano, garlic, and chives (dying tulips in the background). Chives were one of the first things that came up when the snow cleared out — we’ve been eating them since late April. I’ve also dried some oregano. 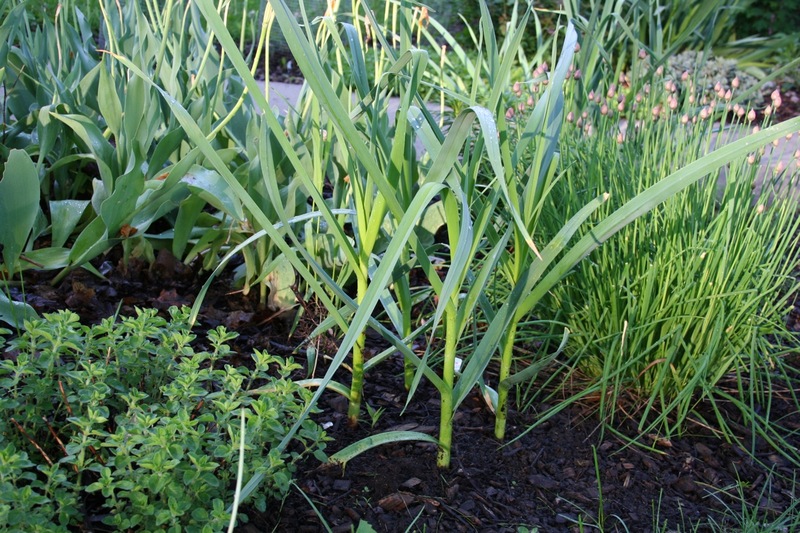 Garlic scapes will pop up in the next two weeks. 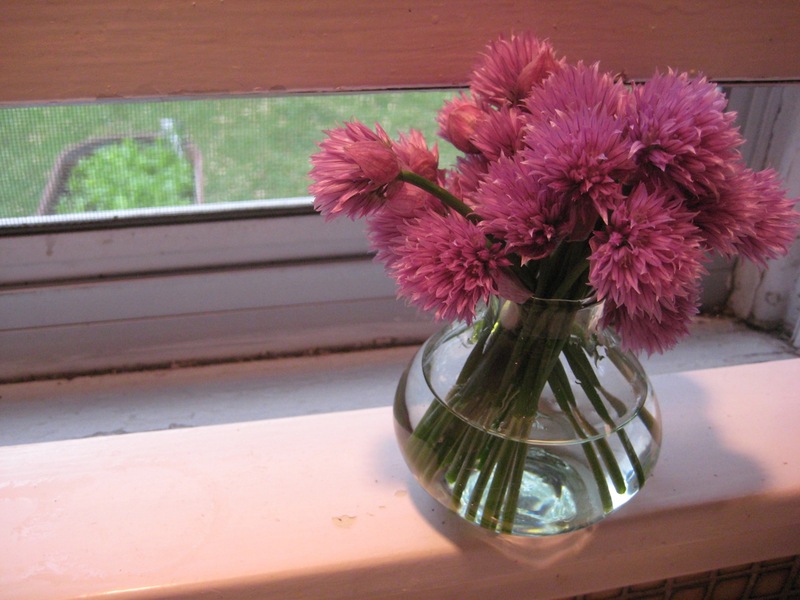 Chive flowers, which are also an interesting addition to salads. I prefer to eat them before they open, though. It’s a texture issue. 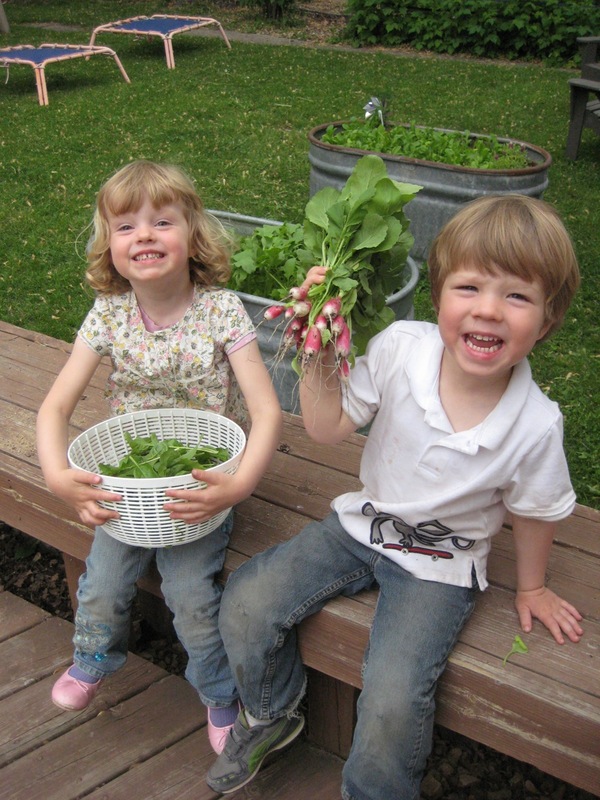 The kids with their first harvest of lettuce and radishes from their gardens (in the background). I’ve read that involving kids with gardening can encourage them to eat more vegetables, but seeing it with my own eyes has been freaking awesome. My almost-4-year-olds, picking radishes, brushing off the dirt, and eating them while jumping on their trampolines. Strange but fun. 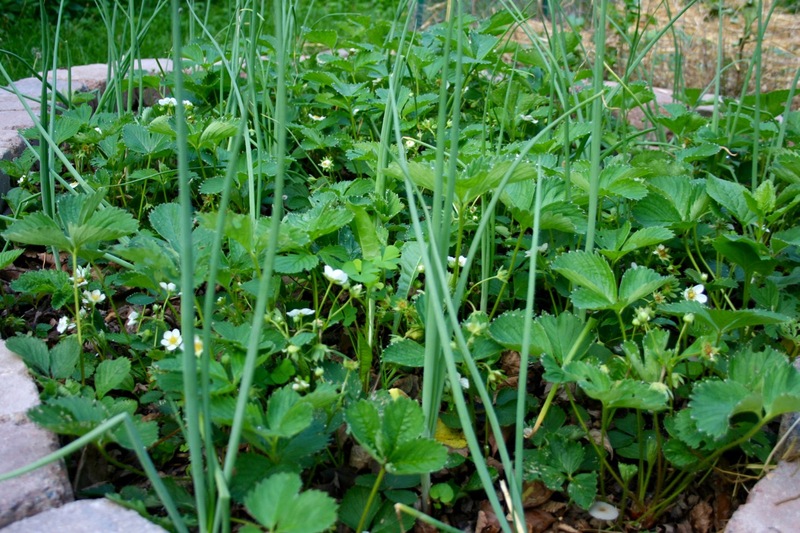 Categories: Gardening, Practical | Tags: edible landscaping, garlic, parenting, strawberries | Permalink. I’m doing two posts tonight, that’s right. This first one is my summary, mostly in pictures, of what we’ve been up to lately. Harvest season has really begun and we’re up to our eyeballs in green beans and up to our, well, ankles in raspberries (they only just started). No complaints, really. Anyway after this I have a great recipe I’d like to share, but I’ll do that as a separate post so I can, like, keep my recipe posts pure or something. So far no preserving of raspberries has been necessary. Having a hard time keeping the kids out of the raspberry hedge. They each had several timeouts tonight for picking underripe berries. Another day, another basket o’ beans. I blanched them for a couple minutes (Adam said “you nimrod 90 seconds is more than enough” but I like them a little softer). I was able to freeze 2 quart size bags, bringing my grand total of bean preservation to 3 quarts. Plus we’ve eaten some too. Adam ripped out all of our bolted lettuce today. We’re trying to find the energy to plant something else there; most likely some kale. Not anymore tonight though. FINALLY. We have tomatoes. Over the past few weeks I’ve watched the plants getting bigger and bigger (they’re about 5 ft tall now) and they had so few blossoms. This week they finally started setting fruit. Going to be a couple more weeks but at least I know that it will happen now. We can probably make fried green tomatoes one of these days too. Here’s the whole garden. Shoot, this was almost a week ago now. See how behind I am? The zucchini have thankfully stopped getting bigger and now are setting to fruit. We will be giving away zucchini soon, I fear. Those things are massive. 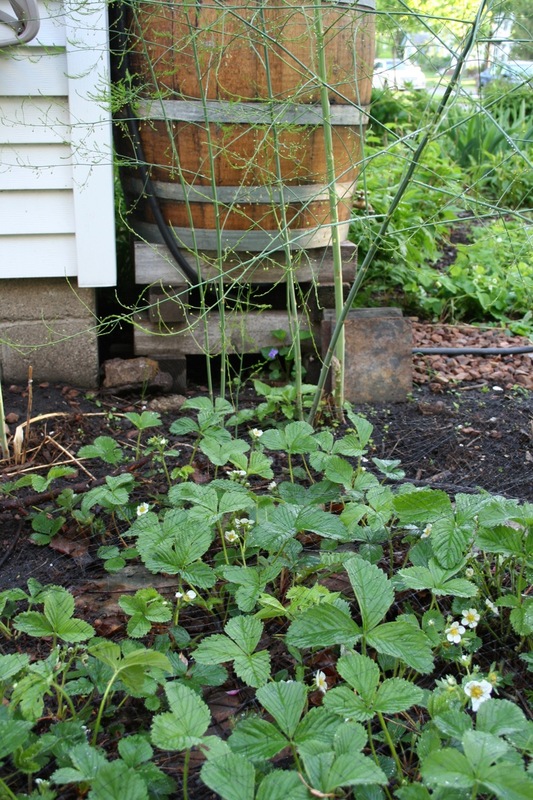 Finally, I used a box of old slate tiles from an old project in our old house to make some little paths through the strawberries and asparagus, and to the rain barrel (we used to have the time and money to do things like remodel our bathroom with slate tile, imagine that). I didn’t do a super fantastic bang-up job and there might be some re-positioning of tiles every spring, but it works for me! So yeah, we’re keeping busy. 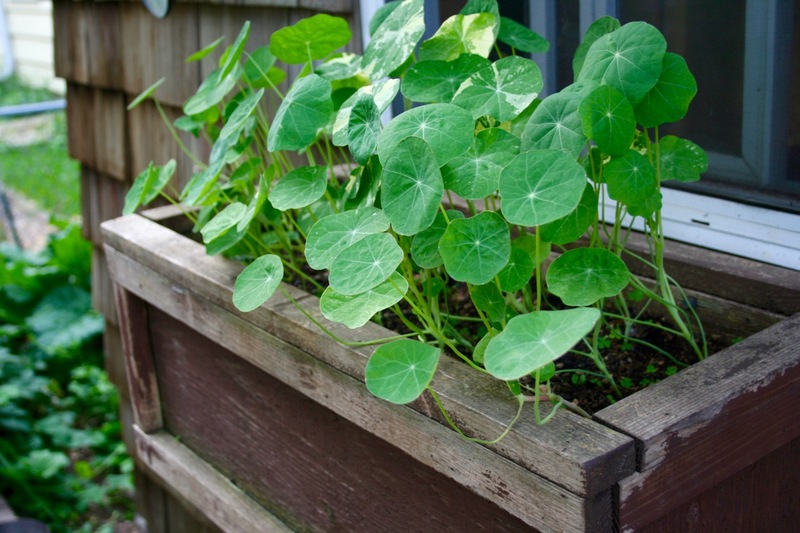 Categories: Gardening, Practical | Tags: beans, raspberries, strawberries | Permalink. We packed up a flat and brought them home and planted them in my failed-rhubarb spot from earlier this spring. I like strawberries better than rhubarb anyway. I am always doing this work in half-light which really impedes my photography, but oh well you get the point. 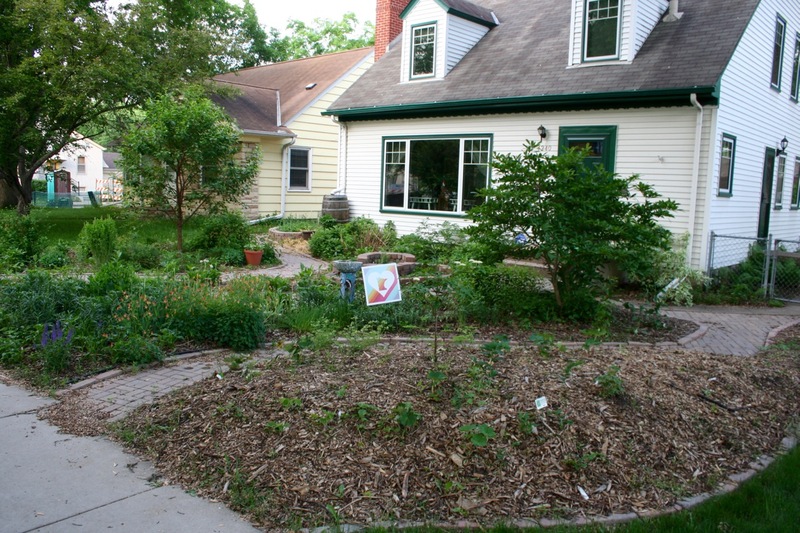 This is the east side of the garden, at the front of the house (SE corner). My plan for this spot is asparagus along the back, then a little walking path (yet to be installed) and then strawberries in front. As you can see I have an unplanned hollyhock. A HUGE unplanned hollyhock. I planted it from seed last year and it never really did anything so I had counted it as a loss. I love hollyhocks but this is a little bit too big; I don’t want it interfering with my asparagus. Next year I will divide it and keep a smaller version here and move the rest…. somewhere else. Coming later this week: homemade kimchi! Categories: Gardening, Practical | Tags: strawberries | Permalink.